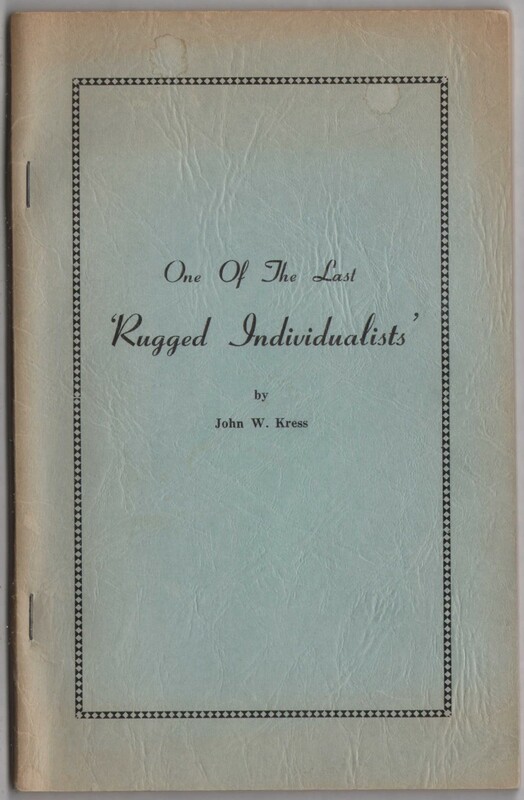 The Last of the "Rugged Individualists"
The term "RUGGED INDIVIDUALIST" was conjured up, by the great Franklin Delano Roosevelt, to express his contempt for the men he had never emulated, but always envied. The men of this country, who on the whole, had started from the humblest of beginnings and as a general rule by thrift, unceasing devotion to their aims, and denial of many of the pleasures of life - had attained more or lea of a success ~ the financial world. This book is an endeavor to portray the trials and tribulations, the incentives, and the endeavors to attain such a success in a more or less limited degree. It encompasses a history of almost 80 years, almost 60 of them devoted to the business world. It covers a period the advancement of our beloved country, that has seen more changes in every way - than the 1900 years before this since the comL~g of Christ - a period from a cowpath economy to the arrival on the moon. Considerable time is spent on the early trying days in the hope that the youth of these times might learn to some degree the living standards of those early times and the efforts their forebears must have made to give them the wonderful things they now enjoy in life. The almost 60 years in business are practically all in mercha~did~g covering almost every item known to man in the effort to become a "RUGGED INDIVIDUALIST." The war years are taken from a book originally written in France ~ the long wait there before being able to return to this ~country. The pictures were secured on weeks spent on the original battlefields With a camera borrowed from a sister and smuggled against outact rules to France and deep down in mind must have had some idea oil this in mind when leaving for Entrance. Looking back now on almost 80 years of time I find that the greatest emotional period of the writer' life was - the moment of. 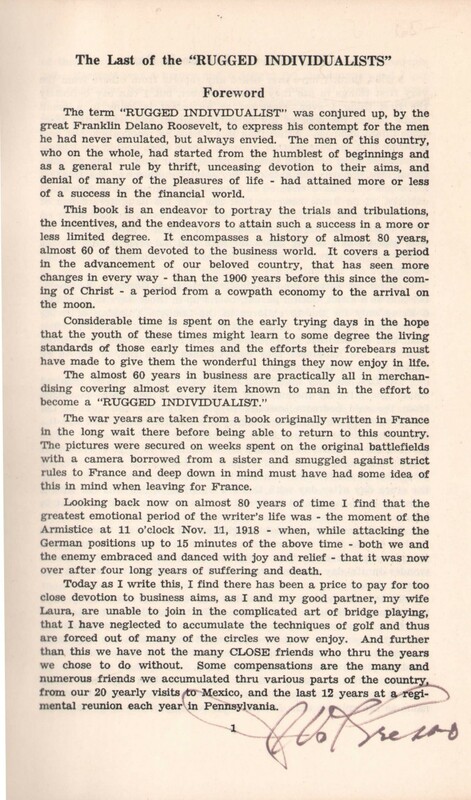 the Notice at 11 o'clock Nov. 11, 1918 - when, while attacking the German positions up to 15 minutes of the above time - both we and the enemy embraced and danced with joy and relief - that it was now over after four long years of suffering and death. Today as I write this, I find there has been a price to pay for too close devotion to business aims, as I and my good partner, my wife Inure, are unable to join in the complicated art of bridge playing, that I have neglected to accumulate the techniques of golf and thus ~ forced out of many of the circles we now enjoy. And further than this we have not the many CLOSE friends who thru the years ~ chose to do without. Some compensations are the many and numerous friends we accumulated thru various parts of the country, from our 20 yearly visits to Mexico, and the last 12 years at a regimenal reunion each year in Pennsylvania. I don't think I have ever heard any reports from others from the very first things in life they ever remember, but I can say definitely the first thing I ever remember as an infant is being in a small cradle behind the door of my parents' bedroom and recovering from some infant sickness. Other than this I have no recollection, but now knowing that another brother must have been close behind me I know I could not have occupied this favorite spot for long. Being an emo­tional man, I never can speak of my saintly mother and the things I know she must have endured in those days without going overboard entirely. I do know however that she was the daughter of one of those stiff-backed characters one sees today, so often portrayed on TV - a slim, tall, rugged character with a chin mustache while his wife was a small, strong character with that old style bonnet always available. Both were of German extraction and originally from the old sod. As for my father, who originally came from Germany, I remem­ber him as a strict, dutiful parent, bound up in those days in providing a living only for the 10 children in the family. Thinking of living as we know it today, I know that most of us who remember, often wish that life had not been quite so severe for them, and yet, I often wonder if the happiness they enjoyed then, from life, is not to be envied by us of the present. 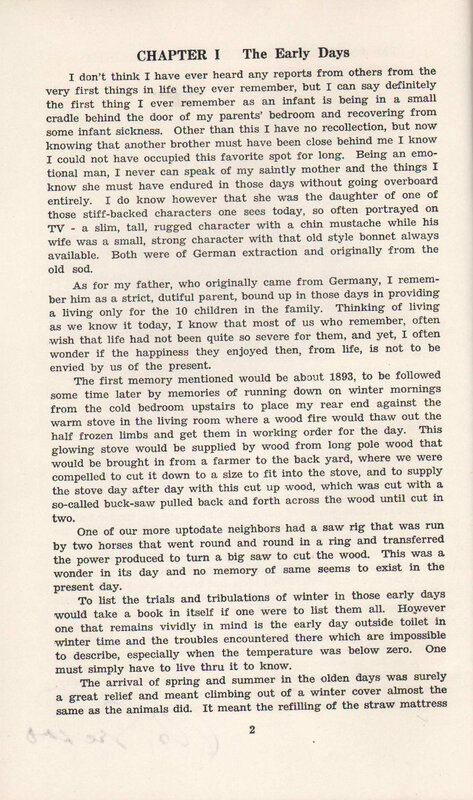 The first memory mentioned would be about 1893, to be followed some time later by memories of running down on winter mornings from the cold bedroom upstairs to place my rear end against the warm stove in the living room where a wood fire would thaw out the half frozen limbs and get them in working order for the day. This glowing stove would be supplied by wood from long pole wood that would be brought in from a farmer to the back yard, where we were compelled to cut it down to a size to fit into the stove, and to supply the stove day after day with this cut up wood, which was cut with a so-called buck-saw pulled back and forth across the wood until cut in two. One of our more uptodate neighbors had a saw rig that was run by two horses that went round and round in a ring and transferred the power produced to turn a big saw to cut the wood. This was a wonder in its day and no memory of same seems to exist in the present day. To list the trials and tribulations of winter in those early days would take a book in itself if one were to list them all. However one that remains vividly in mind is the early day outside toilet in winter time and the troubles encountered there which are impossible to describe, especially when the temperature was below zero. One must simply have to live thru it to know. The arrival of spring and summer in the olden days was surely a great relief and meant climbing out of a winter cover almost the same as the animals did. It meant the refilling of the straw mattress of those days with new straw and a general housecleaning through­out. Barefeet was a luxury and a delight for the summer and I can fdl remember the stubbing of toes on the roots of trees that grew is the paths where cement sidewalks later appeared or picking slivers from feet which trod the more ornate wooden sidewalks. 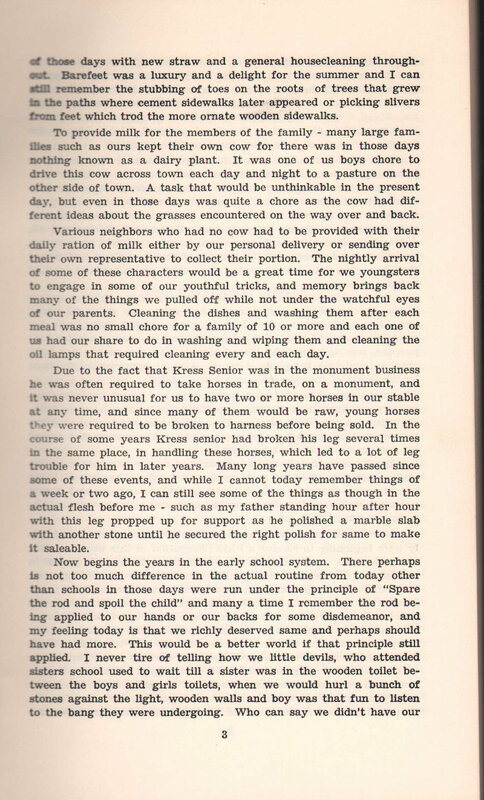 To provide milk for the members of the family - many large families such as ours kept their own cow for there was in those days nothing known as a dairy plant. It was one of us boys chore to drive this cow across town each day and night to a pasture on the other side of town. A task that would be unthinkable in the present day, but even in those days was quite a chore as the cow had dif­ferent ideas about the grasses encountered on the way over and back. Various neighbors who had no cow had to be provided with their .daily ration of milk either by our personal delivery or sending over their own representative to collect their portion. The nightly arrival of some of these characters would be a great time for we youngsters to engage in some of our youthful tricks, and memory brings back :r.nny of the things we pulled off while not under the watchful eyes of our parents. Cleaning the dishes and washing them after each rr.eal was no small chore for a family of 10 or more and each one of .js had our share to do in washing and wiping them and cleaning the o:! lamps that required cleaning every and each day. Due to the fact that Kress Senior was in the monument business hv was often required to take horses in trade, on a monument, and :'. was never unusual for us to have two or more horses in our stable -. : any time, and since many of them would be raw, young horses . . . y were required to be broken to harness before being sold. In the :rso of some years Kress senior had broken his leg several times :r. the same place, in handling these horses, which led to a lot of leg trouble for him in later years. Many long years have passed since >ome of these events, and while I cannot today remember things of a week or two ago, I can still see some of the things as though in the actual flesh before me - such as my father standing hour after hour with this leg propped up for support as he polished a marble slab with another stone until he secured the right polish for same to make it saleable. Now begins the years in the early school system. There perhaps is not too much difference in the actual routine from today other than schools in those days were run under the principle of "Spare the rod and spoil the child" and many a time I remember the rod be­ing applied to our hands or our backs for some disdemeanor, and my feeling today is that we richly deserved same and perhaps should have had more. This would be a better world if that principle still applied. I never tire of telling how we little devils, who attended sisters school used to wait till a sister was in the wooden toilet be­tween the boys and girls toilets, when we would hurl a bunch of stones against the light, wooden walls and boy was that fun to listen to the bang they were undergoing. Who can say we didn't have our simple fun in those days? It was now about 1905 that the horseless carriage was to appear. I remember well the first in our town, a little red two seater owned by an official of the big lumber mill who lived across the street from us. Many a time we youngsters would run along side this creature as it went thru the sand in the street and yell "Get a Horse" the popular cry in those days when the cars first appeared. The youth of today have little appreciation of the conditions prevailing in this community even as few years back as 1900. Con¬sider now the throughway and the many numerous highways con¬necting Sparta and Tomah. In those years, not so long gone, prac¬tically no one knew of a sand road to go from one town to another and the only connecting link was the railroad used by one and all. A situation almost impossible to visualize today. Little appreciation is shown your forebears for the amount of time and effort and money that has gone into these many things that are taken for granted today. 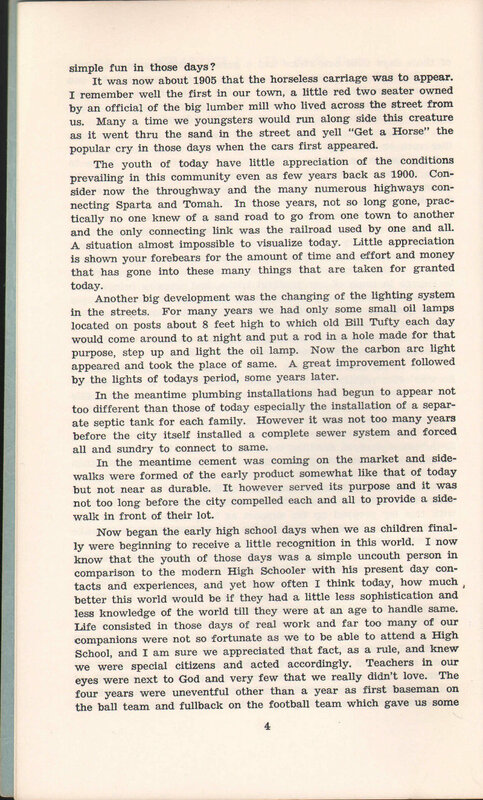 Another big development was the changing of the lighting system in the streets. For many years we had only some small oil lamps located on posts about 8 feet high to which old Bill Tufty each day would come around to at night and put a rod in a hole made for that purpose, step up and light the oil lamp. Now the carbon arc light appeared and took the place of same. A great improvement followed by the lights of todays period, some years later. In the meantime plumbing installations had begun to appear not too different than those of today especially the installation of a separ¬ate septic tank for each family. However it was not too many years before the city itself installed a. complete sewer system and forced all and sundry to 'connect to same. In the meantime cement was coming on the market and side¬walks were formed of the early product somewhat like that of today but not near as durable. It however served its purpose and it was not too long before the city compelled each and all to provide a side¬walk in front of their lot. and about the only contact with any outside world, in some towns around Tomah. Joining the local band too brought some outside contact, especially one summer when we played at the Milwaukee S'-ste fair, which really made an impression. Mention must here be made of the summer months when school .. -s not in session. The first work I ever remember earning- a few r« r.r.ies was helping my oldest sister to pick strawberries at the local patch of one - Louie Storkel, and his horse Nellie - being so young a.~ only to be allowed to help her lift and carry the berries. This as I ^:L--.V up, for many years was a place for me to earn pennies each .- .rr.n.or and even later to help him after school in a greenhouse he :,--. and to this day is still in existence. I think I became a little '. . i involved in his work and spent many an afternoon after school at -.vork in his plant when I could hear the cries of friends having a i.-'.od time in play. This contributed a lot to my belief that life was a hard lot for me personally. In my last year in High School, while playing- first base on the ball team and fullback on the football team, I can't remember that ..ve broke any records, but I do remember seeing the world a little un some trips out of town. Some things in 1910 were shaping up a lot as they exist today. Along in the winter occurred an event which ; know now had much to do with the shaping of my future life. I i:ot involved in the debating team under the supervision of a Mr. N'Lxon, and among the events one night we engaged in a debate -.v-ith a team at Baraboo, Wis. While today I do not remember the subject or how the debate came out, I do remember that the next morning Mr. Nixon prevailed upon me to go to Madison by train, .A-hich was nearby, and to visit the University of Wisconsin. I do not know exactly what his purpose was then, but in after years I often thought that he wanted me to get the urge to go there the fol¬lowing year in the fall, after my graduation from High School. I do know that after visiting there and the big library and seeing the activity of the students, I came away with the determination that I would enroll there the following- fall if I had "To scrub my way thru" which I literally did in the years to follow. Across the road from my home lived a family by the name of Finnerty with about as many young characters as in our own family. In the course of conversation with some of the boys I learned that an aunt of theirs ran a boarding house at the University in Madison, and after some correspondence with her back and forth finally secured a job there to earn my board washing dishes. 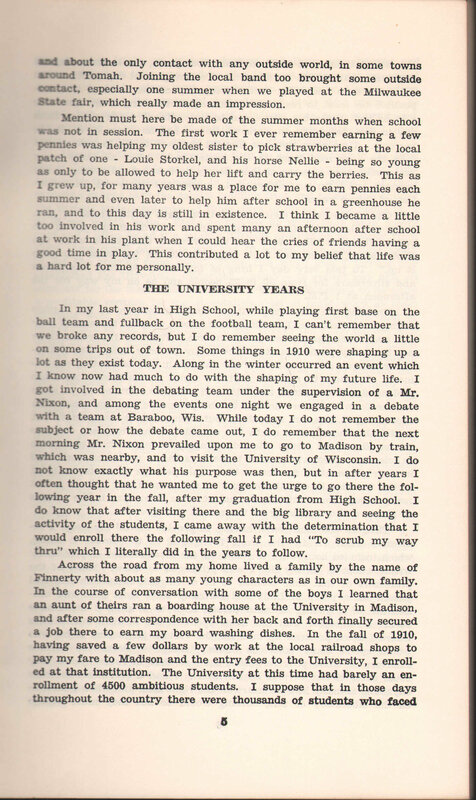 In the fall of 1910, having saved a few dollars by work at the local railroad shops to pay my fare to Madison and the entry fees to the University, I enroll¬ed at that institution. The University at this time had barely an en¬rollment of 4500 ambitious students. I suppose that in those days throughout the country there were thousands of students who faced the trying times that I did in those first years, for in those days it was just a part of life for all of us. For the present day youth - thru TV - the auto - and the excess prosperity of the country, it is im¬possible for most to realize the enormity of breaking from home ties - to be lost in the big city - and to live without funds almost from day to day, depending on work which you had no desire or ability to perform. Time after time the thought occurred to me to give up and take the easy road home to the home fires. After all these many years, memories of some of those lonely periods remain vividly in my memory and I am sure did much to harden the spirit and determina¬tion of future years. One of the proud memories of those days is the praise of Mrs. Gray (my landlady) God rest her soul . who often told me in the years afterward "Boy were you an awkward dishwasher when you first started, but no one could beat you at the job when you gave it up." To this very day I brag of my ability to wash the dishes and silverware for from 30 to 35 people and be on my way for the afternoon at 1 P.M. Entering the University without much knowledge of the various callings requirements, I frankly think now I adopted the easiest way out and chose the Course in Commerce. Thru all the years there not too many professors stand out in my memory other than a Pro¬fessor Oilman and Elwell who was famous in the accounting depart¬ment. 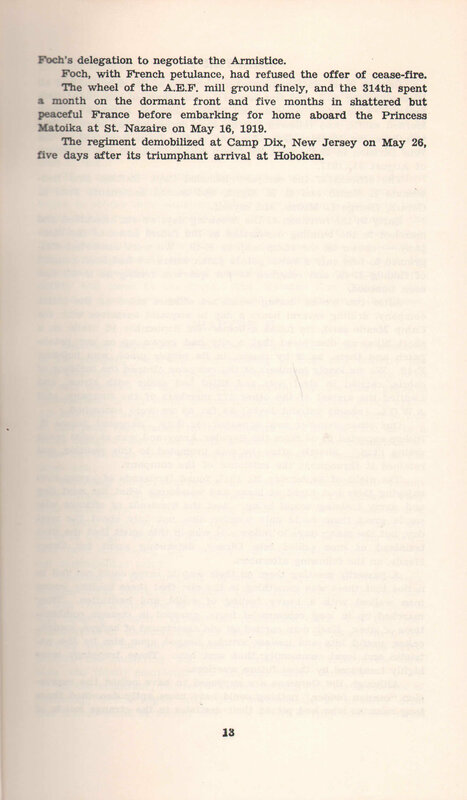 It seems to me now that too many of the studies were too prolonged and contained too little and could be summed up in more concise form if it were desired by the powers to be - for other than accounting it was not specialized but seemed to be designed to put a little bit more polish on to the candidate, when he went out into the world. By all means this did not apply to engineers or physicians or science courses, who even in those days had to work and work hard in their preparation for future life. This perhaps accounts for a lot of the troubles in our Universities of the present day - there is not really enough for an ambitions student to do other than in the courses as above outlined, leading to the unrest that prevails. Thru all the four years, having to provide for all my keep, I re¬member most vividly the work I engaged in to provide a living, which included housework for some o-f the most refined of professors' wives, whom in all my life I was privileged to know. 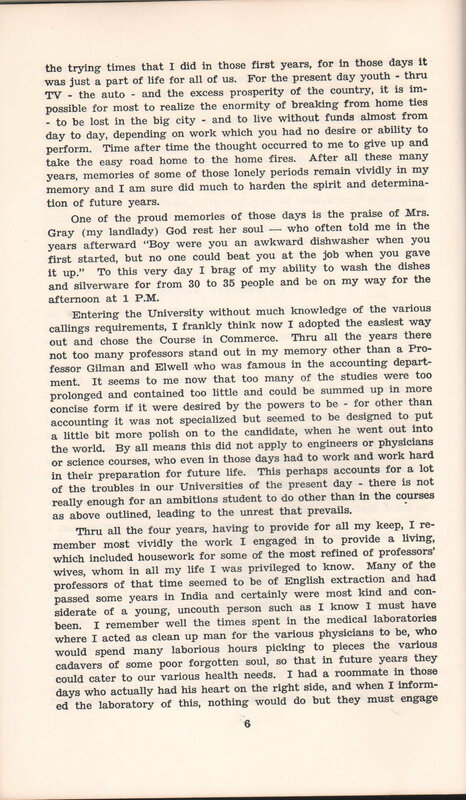 Many of the professors of that time seemed to be of English extraction and had passed some years in India and certainly were most kind and con¬siderate of a young, uncouth person such as I know I must have been. I remember well the times spent in the medical laboratories where I acted as clean up man for the various physicians to be, who would spend many laborious hours picking to pieces the various cadavers of some poor forgotten soul, so that in future years they could cater to our various health needs. I had a roommate in those days who actually had his heart on the right side, and when I inform¬ed the laboratory of this, nothing would do but they must engage him to play tricks on various doctors and their own friends and ssasy a hilarious time was had by all. The last three years was spent willing on table also, most especially in fraternity houses where sore or less of the snobbish characters of those days were to be found, but many an association of kindness was also remembered. As a waiter, I am proud to say that few of the characters I meet today could outperform me in service to the customer. 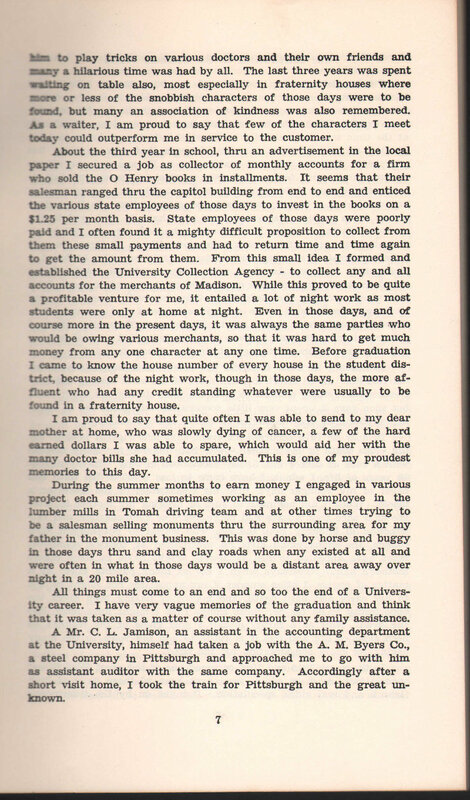 About the third year in school, thru an advertisement in the local paper I secured a job as collector of monthly accounts for a firm who sold the O Henry books in installments. It seems that their salesman ranged thru the capitol building from end to end and enticed the various state employees of those days to invest in the books on a $1.25 per month basis. State employees of those days were poorly paid and I often found it a mighty difficult proposition to collect from them these small payments and had to return time and time again to get the amount from them. From this small idea I formed and established the University Collection Agency - to collect any and all accounts for the merchants of Madison. While this proved to be quite a profitable venture for me, it entailed a lot of night work as most students were only at home at night. Even in those days, and of course more in the present days, it was always the same parties who would be owing various merchants, so that it was hard to get much money from any one character at any one time. Before graduation I came to know the house number of every house in the student dis¬trict, because of the night work, though in those days, the more af-r.uent who had any credit standing whatever were usually to be found in a fraternity house. I am proud to say that quite often I was able to send to my dear mother at home, who was slowly dying of cancer, a few of the hard earned dollars I was able to spare, which would aid her with the many doctor bills she had accumulated. This is one of my proudest memories to this day. During the summer months to earn money I engaged in various project each summer sometimes working as an employee in the lumber mills in Tomah driving team and at other times trying to be a salesman selling monuments thru the surrounding area for my father in the monument business. This was done by horse and buggy in those days thru sand and clay roads when any existed at all and were often in what in those days would be a distant area away over aight in a 20 mile area. All things must come to an end and so too the end of a Univers¬ity career. I have very vague memories of the graduation and think that it was taken as a matter of course without any family assistance. 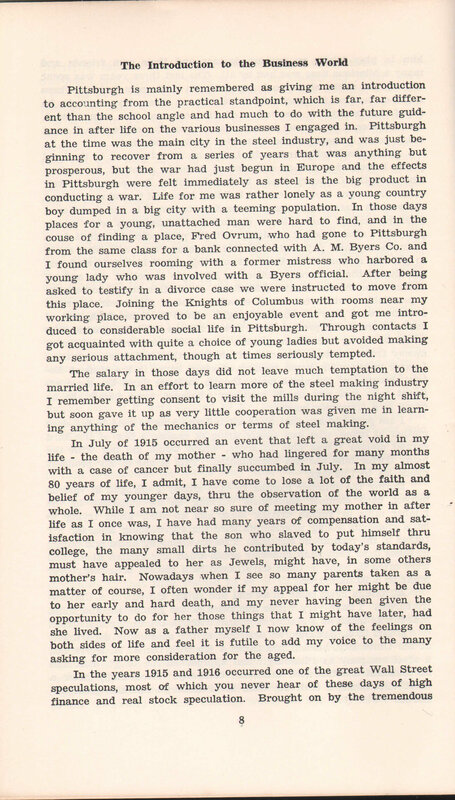 A Mr. C. L. Jamison, an assistant in the accounting department at the University, himself had taken a job with the A. M. Byers Co., a steel company in Pittsburgh and approached me to go with him as assistant auditor with the same company. Accordingly after a short visit home, I took the train for Pittsburgh and the great unknown. Pittsburgh is mainly remembered as giving me an introduction to accounting from the practical standpoint, which is far, far differ¬ent than the school angle and had much to do with the future guid¬ance in after life on the various businesses I engaged in. Pittsburgh at the time was the main city in the steel industry, and was just be-ginning to recover from a series of years that was anything but prosperous, but the war had just begun in Europe and the effects in Pittsburgh were felt immediately as steel is the big product in conducting a war. Life for me was rather lonely as a young country boy dumped in a big city with a teeming population. In those days places for a young, unattached man were hard to find, and in the couse of finding a place, Fred Ovrum, who had gone to Pittsburgh from the same class for a bank connected with A. M. Byers Co. and I found ourselves rooming with a former mistress who harbored a young lady who was involved with a Byers official. After being asked to testify in a divorce case we were instructed to move from this place. Joining the Knights of Columbus with rooms near my working place, proved to be an enjoyable event and got me intro¬duced to considerable social life in Pittsburgh. Through contacts I got acquainted with quite a choice of young ladies but avoided making any serious attachment, though at times seriously tempted. The salary in those days did not leave much temptation to the married life. In an effort to learn more of the steel making industry I remember getting consent to visit the mills during the night shift, but soon gave it up as very little cooperation was given me in learn¬ing anything of the mechanics or terms of steel making. In July of 1915 occurred an event that left a great void in my life - the death of my mother - who had lingered for many months with a case of cancer but finally succumbed in July. In my almost 80 years of life, I admit, I have come to lose a lot of the faith and belief of my younger days, thru the observation of the world as a whole. While I am not near so sure of meeting my mother in after life as I once was, I have had many years of compensation and sat¬isfaction in knowing that the son who slaved to put himself thru college, the many small dirts he contributed by today's standards, must have appealed to her as Jewels, might have, in some others mother's hair. Nowadays when I see so many parents taken as a matter of course, I often wonder if my appeal for her might be due to her early and hard death, and my never having been given the opportunity to do for her those things that I might have later, had she lived. Now as a father myself I now know of the feelings on both sides of life and feel it is futile to add my voice to the many asking for more consideration for the aged. In the years 1915 and 1916 occurred one of the great Wall Street speculations, most of which you never hear of these days of high finance and real stock speculation. Brought on by the tremendous demand for steel from the war in Europe, the steel stocks began to it:-*- tremendous increases, and of course we in the offices became *» ar« of it thru the newspapers, and shortly every clerk with a few iK~.~-a.rs was on the way to becoming a millionaire. Having saved a '.*. *: dollars, I naturally wanted to go the same route and every noon »>.- would gather in some of the many offices that sprang up to take your money. In those days there was no official regulated exchange as we know it today, and accordingly in some accessible office, some am¬bitious person more knowledgeable than the rest of us, would set himself up in the brokerage business to handle our few dollars. Even today there is an expression that has come down thru the years -"The Little Customer is always Wrong" - which slogan was adopted by the knowledgeable characters, much to their regret as it proved later, as there was no limit to the profits or the extent of the top of . any of the stocks. 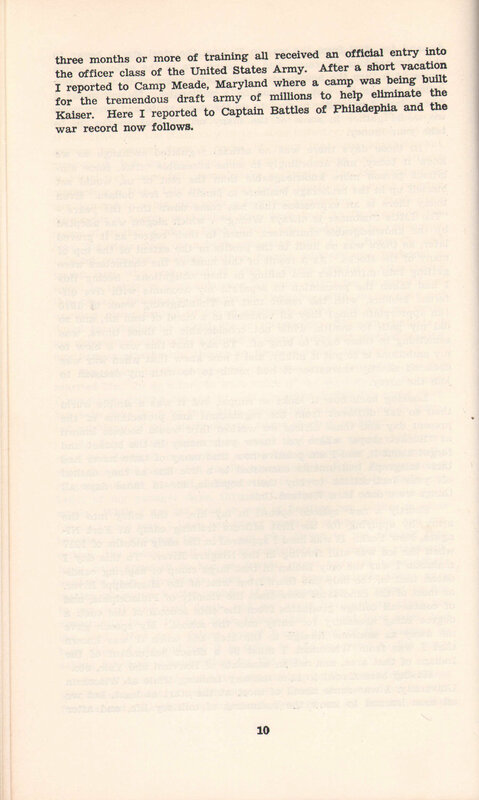 As a result of this most of the characters were petting into difficulties and failing in their obligations. Seeing this I had taken the precaution to separate my accounts with five dif¬ferent brokers, with the result that in Thanksgiving week of 1916 an approrpiate time) they all vanished in a cloud of thin air, and so ii:d my path to wealth, while not considerable in these times, was something in those days to brag of. To say that this was a blow to ..%. ambitions is to put it mildly, and I now know that when war was declared shortly thereafter it had much to do with my decision to ;-::n the army. Looking back now it looks so simple, but it was a simple world tr-.vn so far different from the regulations and protections of the : resent day and those offices we worked thru would become known j_> "Bucket shops" where you threw your money in the bucket and forgot about it, and I am positive now that many of them never had their telegraph instruments connected to a live line as they dashed off your instructions to buy their hopefuls, for in those days all things were done thru Western Union. Shortly a new episode opened in my life, - the entry into the ;i.-my, by applying for the first officers training camp at Fort Ni¬agara, New York. It was here I appeared in the early months of 1917 ..vhen the ice was still flowing in the Niagara River. To this day I maintain I was the only Indian in that large camp of aspiring candi¬dates, that is, the only one there from west of the Mississippi River, :« most of the candidates were from the vicinity of Philadelphia, and of course all college graduates from the elite schools of the east, a degree being necessary for entry into the school. My speech gave rr.e. away as someone foreign to the area and when it was known that I was from Wisconsin, I must be a direct descendant of the Lidians of that area, and not an associate of Harvard and Yale, etc. 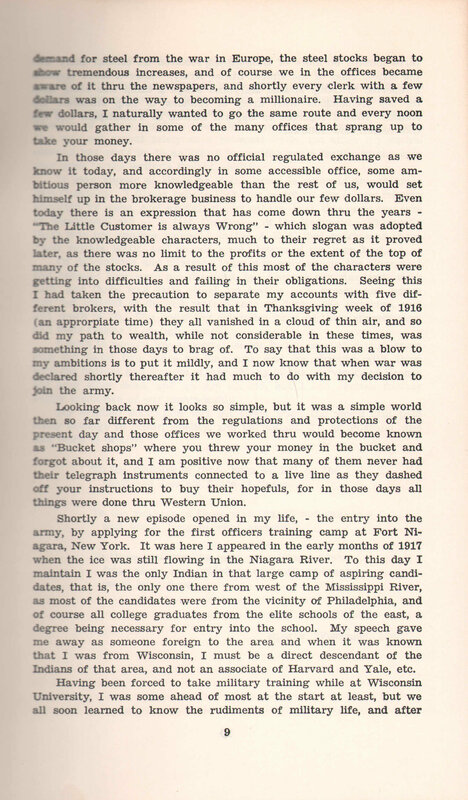 Having been forced to take military training while at Wisconsin University, I was some ahead of most at the start at least, but we all soon learned to know the rudiments of military life, and after three months or more of training all received an official entry into the officer class of the United States Army. After a short vacate I reported to Camp Meade, Maryland where \camp was bemgb^t for the tremendous draft army of millions to help eliminate toe Kaiser. Here I reported to Captain Battles of Philadephia and the war record now follows. Preface This work was conceived 42 years ago in the long dreary months following the Armistice. Those months of inertia and stagnation will leaveforever an unpleasant taste in the mouth and pervert the impression of heroic sacrifice the A.E.F. made for its country. While this was not meant solely as a personal work, too often a personal element has crept in, in an effort to portray some feeling in the only y open to the writer's limited ability. It may appear at times as if too much is made of the Machine .- Company. I firmly believe that this is not so, for it was frankly .-r.:tted by some, and grudgingly by others, that this company was exceptional one . in fact, the flower of the Regiment. Physically ., -ro was not another company in the A. E. F that outclassed them. ». ':r morals, spirit, and morale were always of the very best. Of decorations and citations there was only one in the Company. Not because they were not deserved, but because our standards were h. and there was little effort, no matter how exceptional, which .i not classed as dogged performance of duty. We expected, and '.. much of all. Our doughboy comrades gave us their appreciation, . i their thanks is enough reward. I wish to convey my appreciation for being associated with these ?n for those two years so long ago, and for sharing with them th the horrors and humors of war.. Many of the survivors of France >_- long since dead, and we are all old, but I can cherish forever ppy memories of our comradeship. The 314th Regiment of the 79th Division, A.E.F., organized and trained at Camp Meade, Md., in the latter half of 1917, and even­tually was enrolled over four thousand strong. Under Colonel Wil­liam H. Oury, the 314th marched up the gangplank of the steamer Leviathan at Hoboken, N.J., on July 6, 1918, and two days of sailing preliminaries and six days steaming put them ashore in Brest on July 14. They were welcomed by a summer downpour, a hike, and a painful French trainride to a training area in the Pierrecourt-Frettes vicinity. They were Over There. 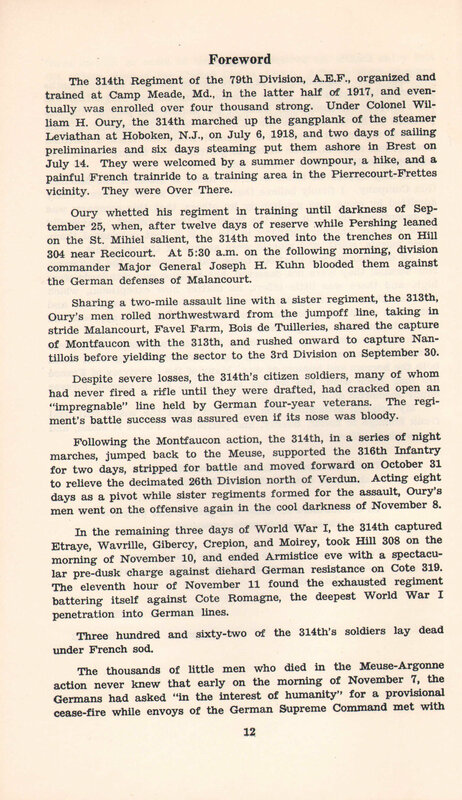 Oury whetted his regiment in training until darkness of Sep­tember 25, when, after twelve days of reserve while Pershing leaned on the St. Mihiel salient, the 314th moved into the trenches on Hill 304 near Recicourt. At 5:30 a.m. on the following morning, division commander Major General Joseph H. Kuhn blooded them against the German defenses of Malancourt. Sharing a two-mile assault line with a sister regiment, the 313th, Oury's men rolled northwestward from the jumpoff line, taking in stride Malancourt, Favel Farm, Bois de Tuilleries, shared the capture of Montfaucon with the 313th, and rushed onward to capture Nan-tillois before yielding the sector to the 3rd Division on September 30. Despite severe losses, the 314th's citizen soldiers, many of whom had never fired a rifle until they were drafted, had cracked open an "impregnable" line held by German four-year veterans. The regi­ment's battle success was assured even if its nose was bloody. Following the Montfaucon action, the 314th, in a series of night marches, jumped back to the Meuse, supported the 316th Infantry for two days, stripped for battle and moved forward on October 31 to relieve the decimated 26th Division north of Verdun. Acting eight days as a pivot while sister regiments formed for the assault, Oury's men went on the offensive again in the cool darkness of November 8. In the remaining three days of World War I, the 314th captured Etraye, Wavrille, Gibercy, Crepion, and Moirey, took Hill 308 on the morning of November 10, and ended Armistice eve with a spectacu­lar pre-dusk charge against diehard German resistance on Cote 319. The eleventh hour of November 11 found the exhausted regiment battering itself against Cote Romagne, the deepest World War I penetration into German lines. Three hundred and sixty-two of the 314th's soldiers lay dead under French sod. The thousands of little men who died in the Meuse-Argonne action never knew that early on the morning of November 7, the Germans had asked "in the interest of humanity" for a provisional cease-fire while envoys of the German Supreme Command met with Foch's delegation to negotiate the Armistice. Foch, with French petulance, had refused the offer of cease-fire. The wheel of the A.E.F. mill ground finely, and the 314th spent * month on the dormant front and five months in shattered but ^.aceful France before embarking for home aboard the Princess JCitoika at St. Nazaire on May 16, 1919. The regiment demobilized at Camp Dix, New Jersey on May 26, five days after its triumphant arrival at Hoboken. Captain F. F. Battles stepped quickly out of the door we had all been watching and read five names to the group of assembled lieu­tenants. Five young men stepped briskly forward, snapped a newly learned salute, and followed Battles to a corner of the room. Thus was born the Machine Gun Company of the 314th Regiment of the 79th Division in Building A-26, Camp Meade, Md., on the afternoon of August 31, 1917. The officers of the company included Capt. Battles, first lieu­tenants L. Smith and E. E. Mylin, and second lieutenants Fred L. Gerard, George L. Means, and myself. Early in the forenoon of the following day, we six assembled and marched to the building designated as the future home of the com­pany -. shown on the camp map as E-49. We were somewhat cha-grinned to find only a sweet potato patch where we had been assured of finding E-49, and returned to our quarters feeling as if we had been buncoed. After two weeks, during which we officers acted as the entire company, drilling several hours a day to acquaint ourselves with the Camp Meade sand, we found a home. On September 15, while on a short hike, we discovered that a city had grown up on our potato patch and there, as if by magic, in its proper place, was building E-49. We six lonely members of the company cleaned the building of debris, carried in steel cots and filled bed sacks with straw, and awaited the arrival of the other 172 members of the company, still A.W.O.L. (absent without leave) as far as we were concerned. One other member now appeared for duty. Sergeant James R. Bishop reported to us from the Regular Army and was at once made acting "top." Shortly after, he was promoted to this position and retained it throughout the existence of the company. 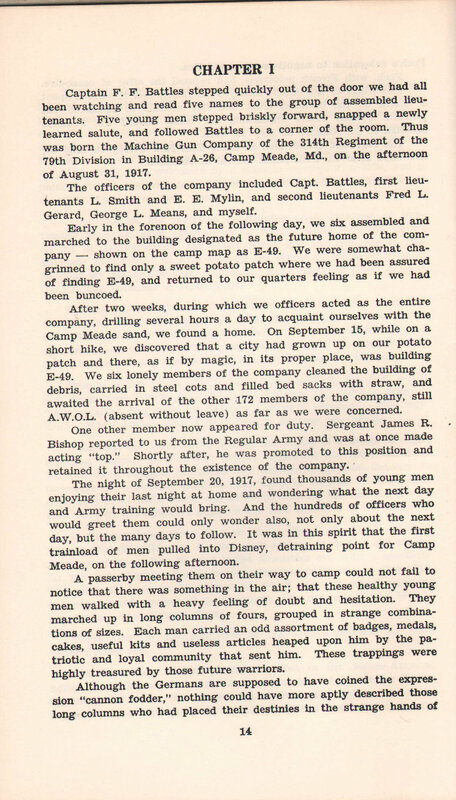 The night of September 20, 1917, found thousands of young men enjoying their last night at home and wondering what the next day and Army training would bring. And the hundreds of officers who would greet them could only wonder also, not only about the next day, but the many days to follow. It was in this spirit that the first trainload of men pulled into Disney, detraining point for Camp Meade, on the following afternoon. A passerby meeting them on their way to camp could not fail to notice that there was something in the air; that these healthy young men walked with a. heavy feeling of doubt and hesitation. They marched up in long columns of fours, grouped in strange combina­tions of sizes. Each man carried an odd assortment of badges, medals, cakes, useful kits and useless articles heaped upon him by the pa­triotic and loyal community that sent him. These trappings were highly treasured by those future warriors. Although the Germans are supposed to have coined the expres­sion "cannon fodder," nothing could have more aptly described those long columns who had placed their destinies in the strange hands of the God of War. One column was directed to the headquarters of the 314th Regi­ment and from this body a group of 35 men, representing Local Board No. One, Montour County, Pa., was sent to Machine Gun Company barracks E-49 to form the nucleus of the company. The 35 were lined up, names taken, mess kits issued, and taken into the building to be assigned bunks. Machine Gun Company was in busi­ness at last. Then came the reaction. Almost to a man, they dropped their bundles on their bunks, sat down on the bunk, chin in hand, and tejran to ponder their situation. Their eyes took on a far-away look, which would remain for some time. Then, slowly, the bolder of the spirits got up and began prying into the secrets of their new home. Three hours later, in the first night darkness, came the sound of songs accompanied by some sort of an instrument. Once more the American care-free spirit had asserted itself and American adapt­ability had come to the front. The Machine Gun Company was started on a successful path to glory and the overthrow of the Kaiser. Saturday, September 22, dawned cool and clear. The 35 members of the company were astir and bustling in their new military life and after an early morning chow of bacon and potatoes were lined up and marched to the regimental hospital for the final physical examination, which would determine fitness for Uncle Sam's army. All had had a superficial examination at the local board, but it was at this point that trained military doctors gave the decision as to a man's ability to stand the terrific strain of war. Any contagious disease was at once found and segregated to prevent its spread to the other men. 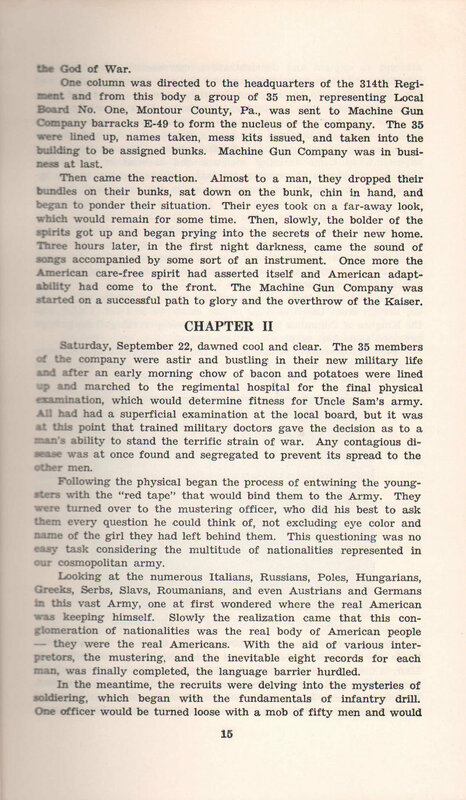 Following the physical began the process of entwining- the young-stvrs with the "red tape" that would bind them to the Army. They .aviv turned over to the mustering officer, who did his best to ask ..r.em every question he could think of, not excluding eye color and r.arne of the girl they had left behind them. This questioning was no -. '.-sy task considering the multitude of nationalities represented in . u: cosmopolitan army. Looking at the numerous Italians, Russians, Poles, Hungarians, Greeks, Serbs, Slavs, Roumanians, and even Austrians and Germans :r. this vast Army, one at first wondered where the real American ..v:is keeping himself. Slowly the realization came that this con­glomeration of nationalities was the real body of American people - they were the real Americans. With the aid of various inter­preters, the mustering, and the inevitable eight records for each ":an. was finally completed, the language barrier hurdled. In the meantime, the recruits were delving into the mysteries of soldiering, which began with the fundamentals of infantry drill. One officer would be turned loose with a mob of fifty men and would attempt to explain and demonstrate a movement in five different languages. At this point, the men who had any military training had the chance to jump to the front for they were at once called upon to assist the instructor, no matter how limited their knowledge. 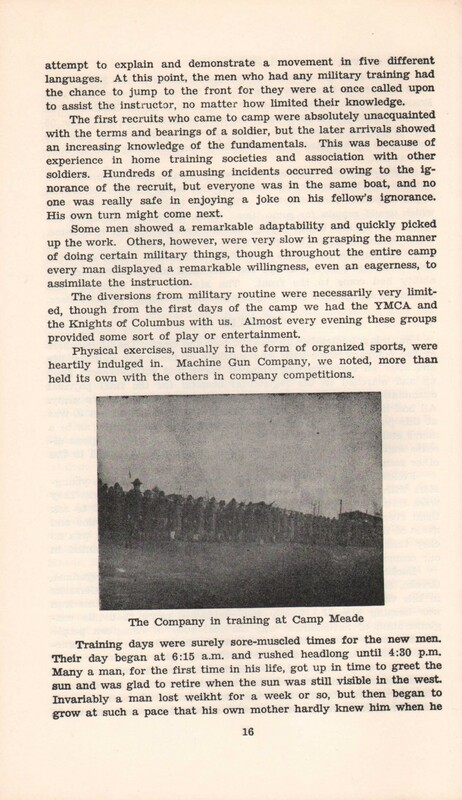 The first recruits who came to camp were absolutely unacquainted with the terms and bearings of a soldier, but the later arrivals showed an increasing knowledge of the fundamentals. This was because of experience in home training societies and association with other soldiers. Hundreds of amusing incidents occurred owing to the ig­norance of the recruit, but everyone was in the same boat, and no one was really safe in enjoying a joke on his fellow's ignorance. His own turn might come next. Some men showed a remarkable adaptability and quickly picked up the work. Others, however, were very slow in grasping the manner of doing certain military things, though throughout the entire camp every man displayed a remarkable willingness, even an eagerness, to assimilate the instruction. The diversions from military routine were necessarily very limit­ed, though from the first days of the camp we had the YMCA and the Knights of Columbus with us. Almost every evening these groups provided some sort of play or entertainment. Physical exercises, usually in the form of organized sports, were heartily indulged in. 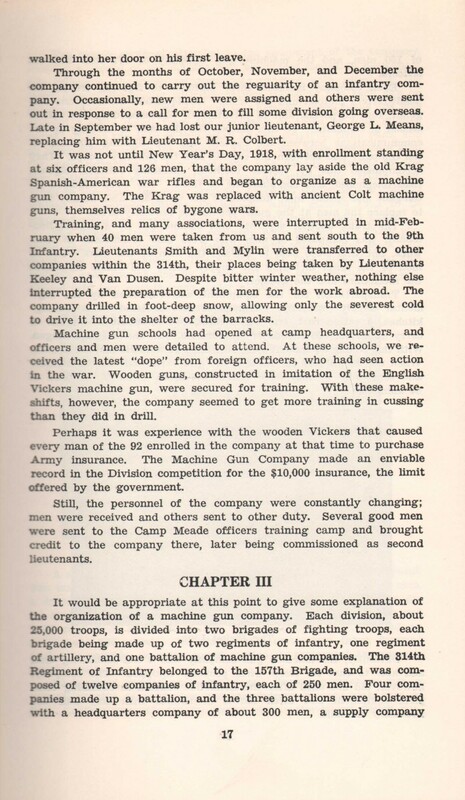 Machine Gun Company, we noted, more than held its own with the others in company competitions. Training days were surely sore-muscled times for the new men. Their day began at 6:15 a.m. and rushed headlong until 4:30 p.m. Many a man, for the first time in his life, got up in time to greet the sun and was glad to retire when the sun was still visible in the west. Invariably a man lost weikht for a week or so, but then began to grow at such a pace that his own mother hardly knew him when he walked into her door on his first leave. Through the months of October, November, and December the company continued to carry out the regularity of an infantry com­pany. Occasionally, new men were assigned and others were sent out in response to a call for men to fill some division going overseas. Late in September we had lost our junior lieutenant, George L. Means, replacing him with Lieutenant M. R. Colbert. 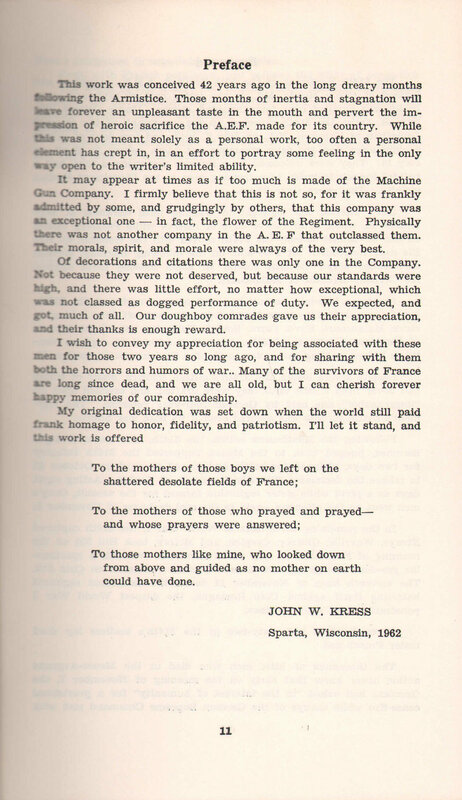 It was not until New Year's Day, 1918, with enrollment standing at six officers and 126 men, that the company lay aside the old Krag Spanish-American war rifles and began to organize as a machine gun company. The Krag was replaced with ancient Colt machine guns, themselves relics of bygone wars. Training, and many associations, were interrupted in mid-Feb­ruary when 40 men were taken from us and sent south to the 9th Infantry. Lieutenants Smith and Mylin were transferred to other companies within the 314th, their places being taken by Lieutenants Keeley and Van Dusen. Despite bitter winter weather, nothing else interrupted the preparation of the men for the work abroad. The company drilled in foot-deep snow, allowing only the severest cold to drive it into the shelter of the barracks. Machine gun schools had opened at camp headquarters, and officers and men were detailed to attend. At these schools, we re­ceived the latest "dope" from foreign officers, who had seen action in the war. Wooden guns, constructed in imitation of the English Vickers machine gun, were secured for training. With these make­shifts, however, the company seemed to get more training in cussing than they did in drill. Perhaps it was experience with the wooden Vickers that caused every man of the 92 enrolled in the company at that time to purchase Army insurance. The Machine Gun Company made an enviable record in the Division competition for the $10,000 insurance, the limit offered by the government. Still, the personnel of the company were constantly changing; men were received and others sent to other duty. Several good men were sent to the Camp Meade officers training camp and brought credit to the company there, later being commissioned as second lieutenants. It would be appropriate at this point to give some explanation of the organization of a machine gun company. Each division, about 25,000 troops, is divided into two brigades of fighting troops, each brigade being made up of two regiments of infantry, one regiment of artillery, and one battalion of machine gun companies. The 314th Regiment of Infantry belonged to the 157th Brigade, and was com­posed of twelve companies of infantry, each of 250 men. Four com­panies made up a battalion, and the three battalions were bolstered with a headquarters company of about 300 men, a supply company of 150 men, and the machine gun company of 172 men and six officers. Each company included -three platoons of fighting troops, the headquarters platoon and the train. Headquarters included one ser­geant, four corporals, and 15 privates, all commanded by the officer second in command. 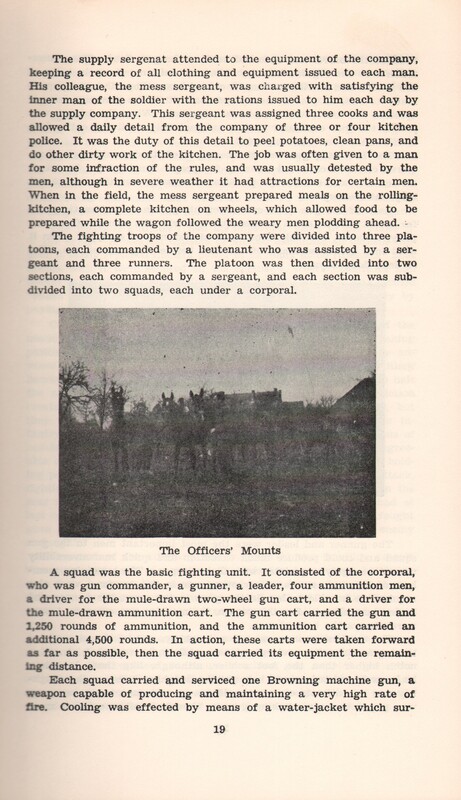 To this platoon fell the task of keeping up the communications between the captain and the fighting platoons of the company and between the captain and the infantry troops. They accomplished this by various methods, including runners, signals, field telephones, and combinations of these. The work required in­telligent and speedy men, adapted to the work and able at any time to replace the men at the guns, should the necessity arise. The train, another separate unit commanded by a second lieu­tenant, was composed of men who were also technicians in their work, but who were able to replace the men at the guns. 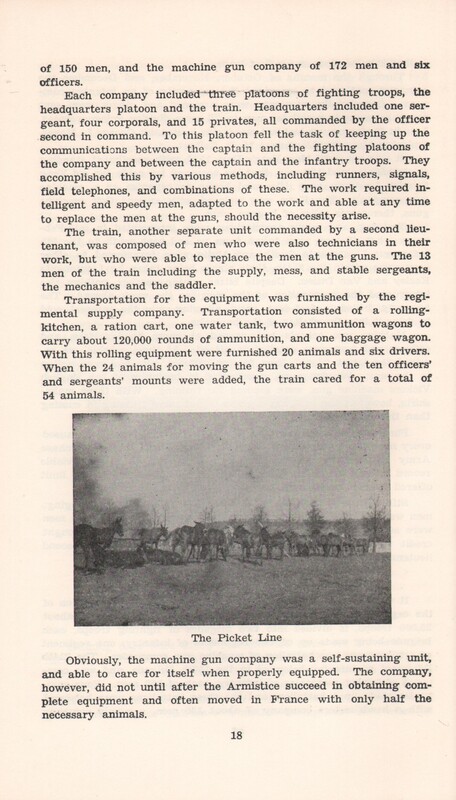 The 13 men of the train including the supply, mess, and stable sergeants, the mechanics and the saddler. Transportation for the equipment was furnished by the regi­mental supply company. Transportation consisted of a rolling-kitchen, a ration cart, one water tank, two ammunition wagons to carry about 120,000 rounds of ammunition, and one baggage wagon. With this rolling equipment were furnished 20 animals and six drivers. When the 24 animals for moving the gun carts and the ten officers' and sergeants' mounts were added, the train cared for a total of 54 animals. Obviously, the machine gun company was a self-sustaining unit, and able to care for itself when properly equipped. The company, however, did not until after the Armistice succeed in obtaining com­plete equipment and often moved in France with only half the necessary animals. The supply sergenat attended to the equipment of the company, keeping a record of all clothing and equipment issued to each man. His colleague, the mess sergeant, was charged with satisfying the inner man of the soldier with the rations issued to him each day by the supply company. This sergeant was assigned three cooks and was allowed a daily detail from the company of three or four kitchen police. It was the duty of this detail to peel potatoes, clean pans, and do other dirty work of the kitchen. The job was often given to a man for some infraction of the rules, and was usually detested by the men, although in severe weather it had attractions for certain men. When in the field, the mess sergeant prepared meals on the rolling-kitchen, a complete kitchen on wheels, which allowed food to be prepared while the wagon followed the weary men plodding ahead. . The fighting troops of the company were divided into three pla­toons, each commanded by a lieutenant who was assisted by a ser­geant and three runners. The platoon was then divided into two sections, each commanded by a sergeant, and each section was sub­divided into two squads, each under a corporal. A squad was the basic fighting unit. It consisted of the corporal, who was gun commander, a gunner, a leader, four ammunition men, a driver for the mule-drawn two-wheel gun cart, and a driver for the mule-drawn ammunition cart. The gun cart carried the gun and 1,250 rounds of ammunition, and the ammunition cart carried an additional 4,500 rounds. In action, these carts were taken forward as far as possible, then the squad carried its equipment the remainng distance. Each squad carried and serviced one Browning machine gun, a weapon capable of producing and maintaining a very high rate of fire. Cooling was effected by means of a water-jacket which sur- rounded the barrel and absorbed heat as the gun fired. The ammu­nition was the regular infantry rifle ammunition put up in belts of 250 rounds and carried in a small oblong box. When the gunner was ready to fire, he placed the end of the belt in the gun and drew it up until the first round was in the chamber. When the trigger was pulled, the gun 'continued to fire automatically until the entire belt of 250 rounds had been expended. The Browning gun was the best gun of its day, although it re­quired constant care and cleaning for proper functioning. In actual service this was not always possible and results sometimes were not very satisfactory. Each of the gun crew carried on his person an automatic pistol for use in case he came to close quarters with the enemy. Our com­pany, however, had only about half of the men so equipped when it went into action, so many of the men be-fore long carried the rifles of dead doughboys. A squad with their carts ready for the road. Guns and ammunition are carried on these carts. 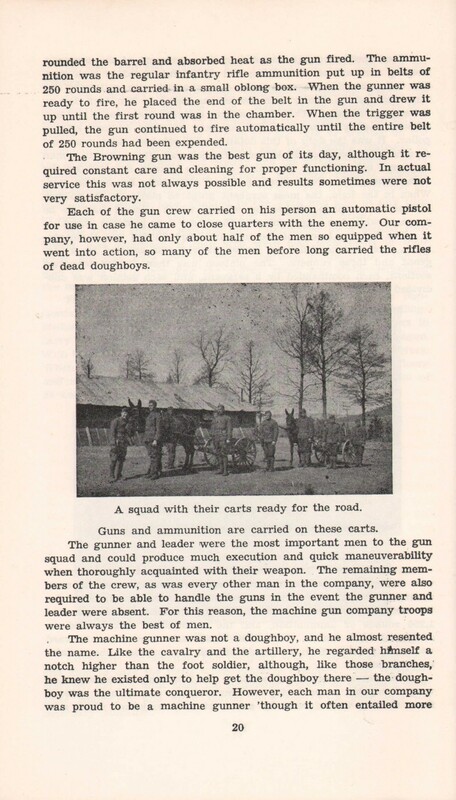 The gunner and leader were the most important men to the gun squad and could produce much execution and quick maneuverability when thoroughly acquainted with their weapon. The remaining mem­bers of the crew, as was every other man in the company, were also required to be able to handle the guns in the event the gunner and leader were absent. For this reason, the machine gun company troops were always the best of men. The machine gunner was not a doughboy, and he almost resented the name. Like the cavalry and the artillery, he regarded hftnself a notch higher than the foot soldier, although, like those branches, he knew he existed only to help get the doughboy there . the dough­boy was the ultimate conqueror. However, each man in our company was proud to be a machine gunner 'though it often entailed more work and precision than other branches of the service. His presence a the machine gun company denoted special qualifications, as this company had the privilege of discarding unqualified men and select­ing the best of the 12 infantry companies of the regiment. Machine gunners throughout the war had made an enviable record, especially in their "suicide squads," and the American gun-r.*r went over with the feeling he must maintain, and better, that record. From the beginning, this pride of organization permeated the company. Even the mule skinners displayed such pride in the possession of their congenial companions, devoted such attention to animals and equipment, that we often received the commendation of the Regimental Colonel and the Brigade General of the 157th Brigade. The machine gun itself had an important place in the make-up cf the army. A weapon capable of vicious execution on certain tar-jC*'-s, it easily replaced the fire power of as many as 50 riflemen. Best rr«-j;ts with it were secured on the defensive, where experience had .-i-^ht it would erect almost impassable barriers of what was termed tandj of fire," allowing the enemy to cross these bands only by -siv-j-.g with staggering losses. 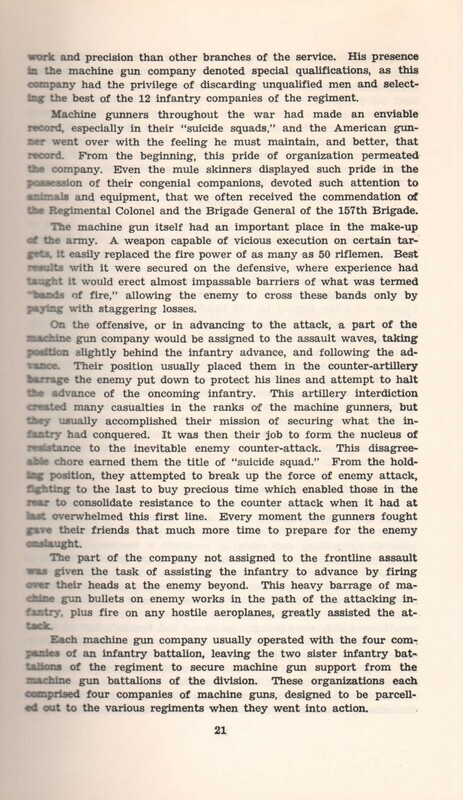 On the offensive, or in advancing to the attack, a part of the .-ichine gun company would be assigned to the assault waves, taking position slightly behind the infantry advance, and following the ad--.ir.ce. Their position usually placed them in the counter-artillery i»a.rrage the enemy put down to protect his lines and attempt to halt ._*-* advance of the oncoming infantry. This artillery interdiction created many casualties in the ranks o-f the machine gunners, but ._".ey usually accomplished their mission of securing what the in-;*r.:ry had conquered. It was then their job to form the nucleus of TT.sistance to the inevitable enemy counter-attack. This disagree-it>> chore earned them the title of "suicide squad." From the hold-tig position, they attempted to break up the force of enemy attack, r^hting to the last to buy precious time which enabled those in the rear to consolidate resistance to the counter attack when it had at list overwhelmed this first line. Every moment the gunners fought five their friends that much more time to prepare for the enemy cesla'jght. Each machine gun company usually operated with the four com­panies of an infantry battalion, leaving the two sister infantry bat-tiiions of the regiment to secure machine gun support from the ..achine gun battalions of the division. These organizations each comprised four companies of machine guns, designed to be parcell­ed out to the various regiments when they went into action.